Smoky chipotle chili filled with leftover turkey and vegetables. 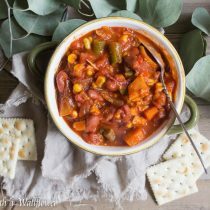 This spicy leftover turkey vegetable chili is delicious and the perfect dish for after Thanksgiving. Omg! There’s just two more days until Thanksgiving, and I feel like there’s still so much to do. 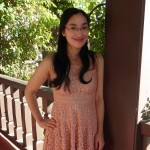 I went grocery shopping over the weekend to try to avoid the crowds and ridiculously long lines, but it was unavoidable. Plus, some of the ingredients I’m looking for are already out of stock. So even though I tried to get ahead with my shopping list, I have no choice but to go back out there and pick up a few more items. We’re thinking this year we want the usual mac and cheese, mashed potatoes, garlic bread, pumpkin pie, brownies. But this year, we’re also adding my honey pear pie, my green bean casserole, and my roasted brussels sprouts. What will you be serving at your Thanksgiving table this year? But with Thanksgiving almost here, I think it’s time to talk about leftovers. Especially the turkey. Because as much as I love eating turkey, there’s always so much leftover. So, I’m giving you a few ideas for all that leftover turkey you’re going to have. As much as I love all the Thanksgiving dishes that we get to indulge in on Thanksgiving Day, I might just love the leftovers more. Does anyone else feel the same way? With leftovers, you get to be as creative as you want. Sandwiches made from all your leftovers are great, but sometimes I want something a little more unique. 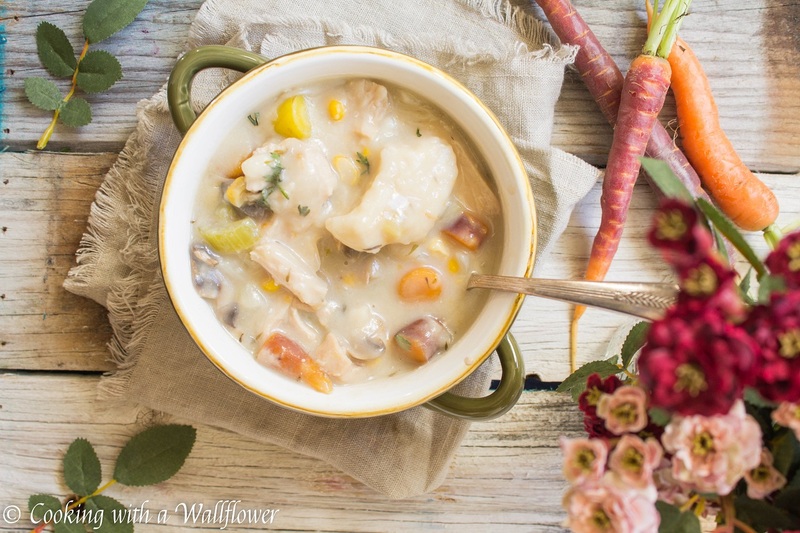 Like this leftover turkey and dumpling soup. 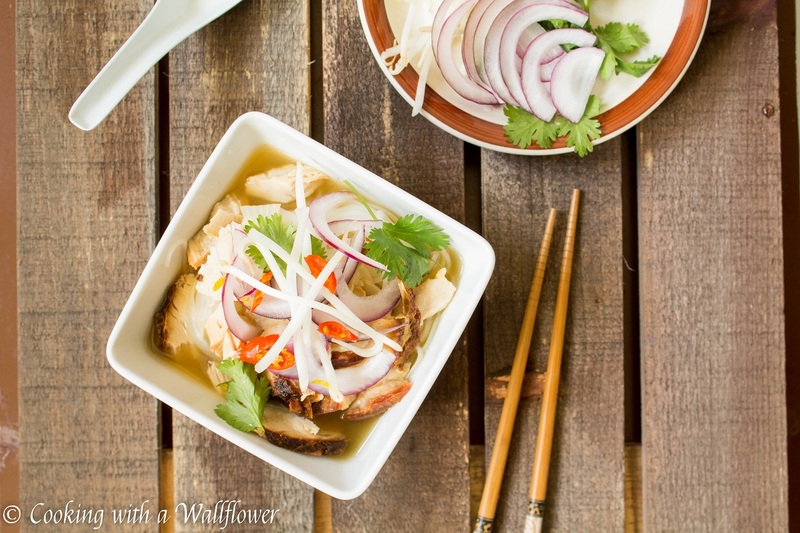 Or this leftover turkey pho. 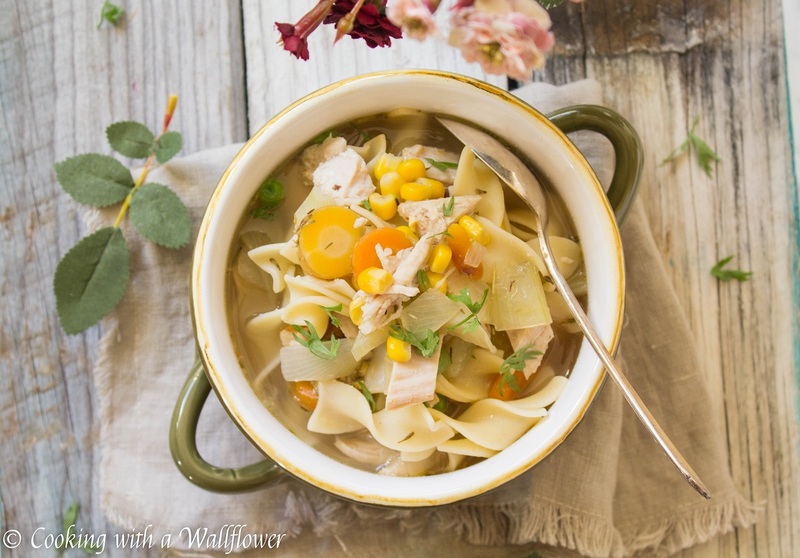 Or this leftover turkey noodle soup. Or this leftover turkey spicy miso ramen. Well, this year, I present to you this leftover turkey vegetable chili. 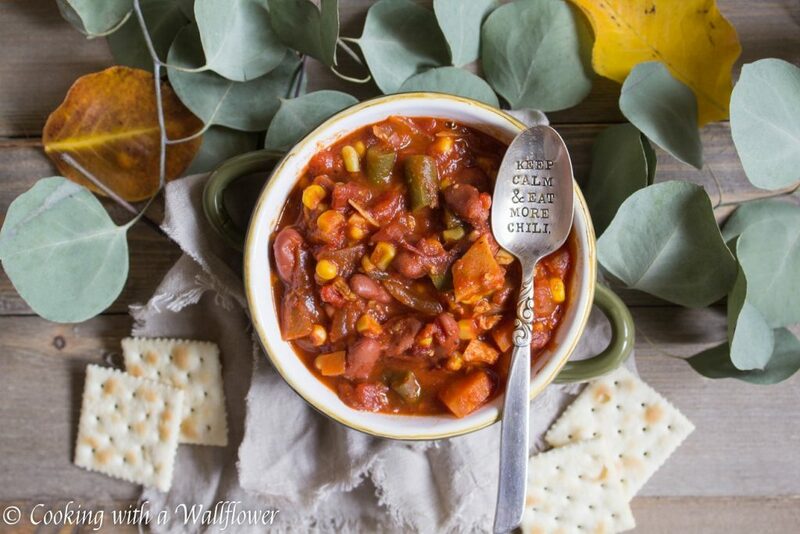 If you love chili as much as my younger sister, Victoria, does (enough that I had a spoon custom made for her) then this dish is definitely for you. 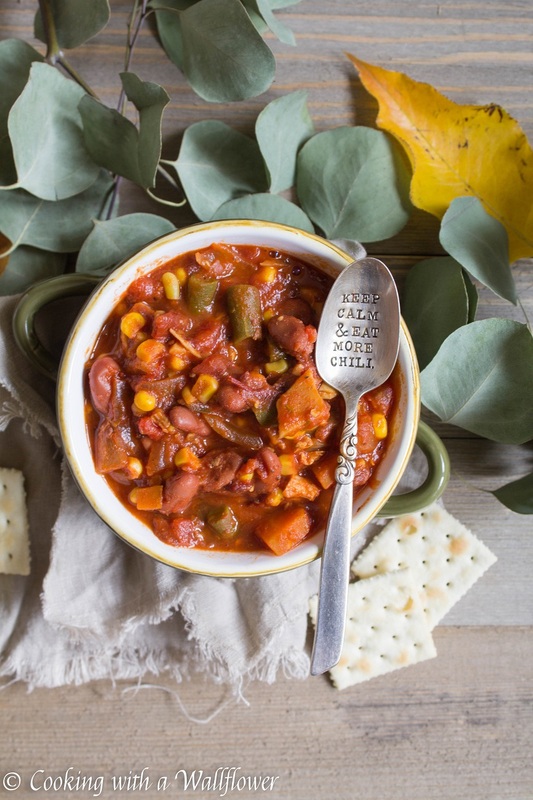 It’s smoky, it’s spicy, it’s hearty, it’s warm, and it’s comforting. 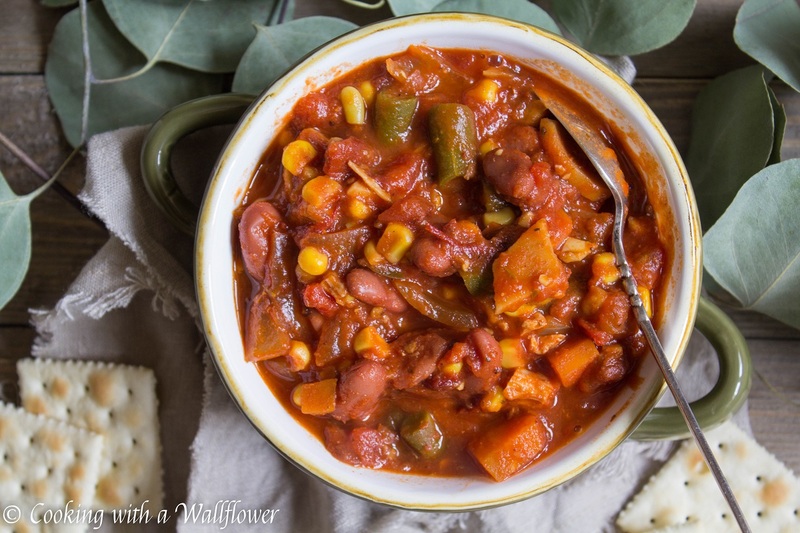 Everything I’m looking for in a dish that will keep me warm and comforted during the last of the chilly fall days. Most of these ingredients were already in my fridge and pantry waiting to be used. So anything you have will work. Just substitute the same amount of one ingredient with another. 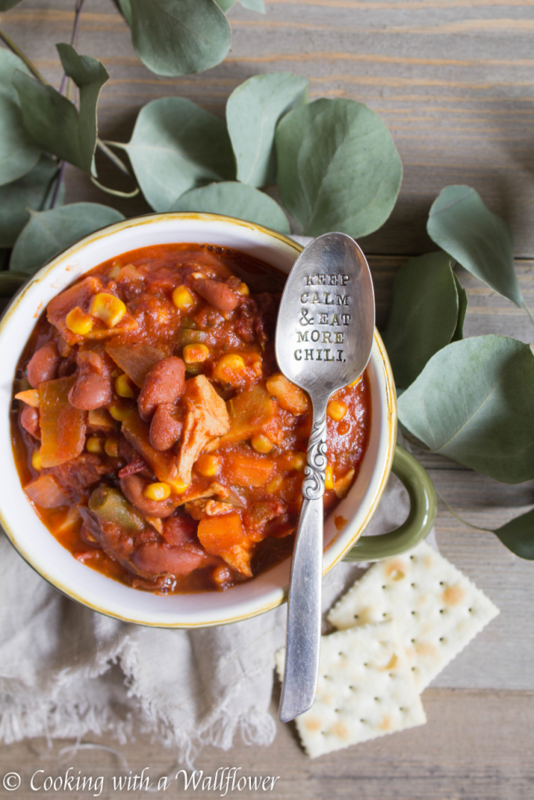 Plus, what I love about this chili is that you can cook it all in one pot. Yes! Because after all those dishes I know I’ll have to wash after our Thanksgiving meal(s), I know I won’t look forward to doing even more dishes. One pot = perfection. In a medium or large pot, add olive oil over low to medium heat. Allow the olive oil to heat for about a minute before adding minced garlic and diced onions. Cook the garlic and onions until they have softened, about two minutes. Next, add the carrots and a splash of broth as needed to prevent the vegetables from burning at the bottom of the pot. Cook the carrots for about 5-7 minutes until they become tender. 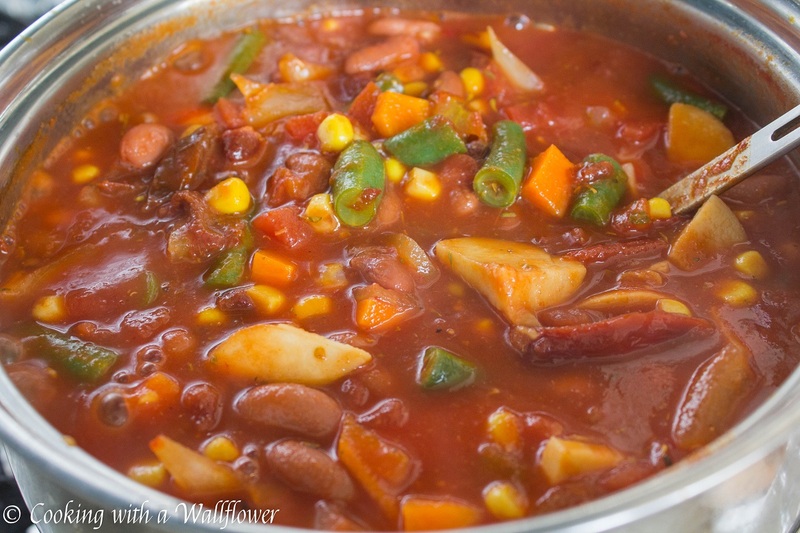 Then add the mushrooms, green beans, kidney beans, and corn. Cook for a few more minutes. Pour in the rest of the broth, diced tomatoes, tomato paste, granulated sugar, and add chipotle peppers and adobo sauce. This version of chili is spicy but you can always add less of the chipotle pepper for a less spicy version. Next, add the seasonings for flavor. 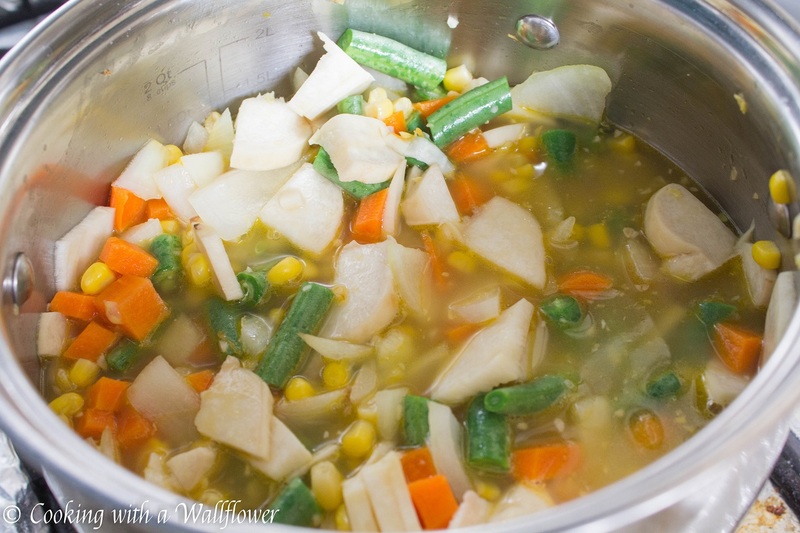 Use a spatula to stir to incorporate all the ingredients and allow it to simmer for 15-20 minutes until all the vegetables are tender. When ready to serve, add the shredded turkey. 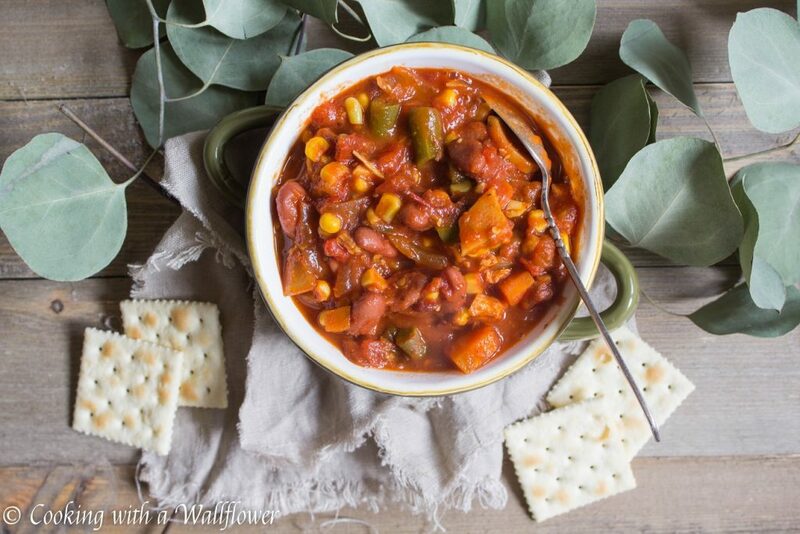 Serve the leftover turkey vegetable chili warm with bread or crackers. Then add the mushrooms, green beans, kidney beans, and corn. Cook for a few more minutes. Pour in the rest of the broth, diced tomatoes, tomato paste, granulated sugar, and add chipotle peppers and adobo sauce. This version is spicy. Add more or less chipotle peppers to taste. Next, add the seasonings for flavor. **This version of chili is made to be spicy. If you prefer yours to be less spicy, add less of the chipotle peppers. This entry was posted in Comfort Food, Entree, Fall Cravings, Farmer's Market, Gluten Free, Holidays, Quick and Easy, Recipes and tagged chili, fall recipes, farmer's market, gluten free, leftover turkey, quick and easy, Thanksgiving. 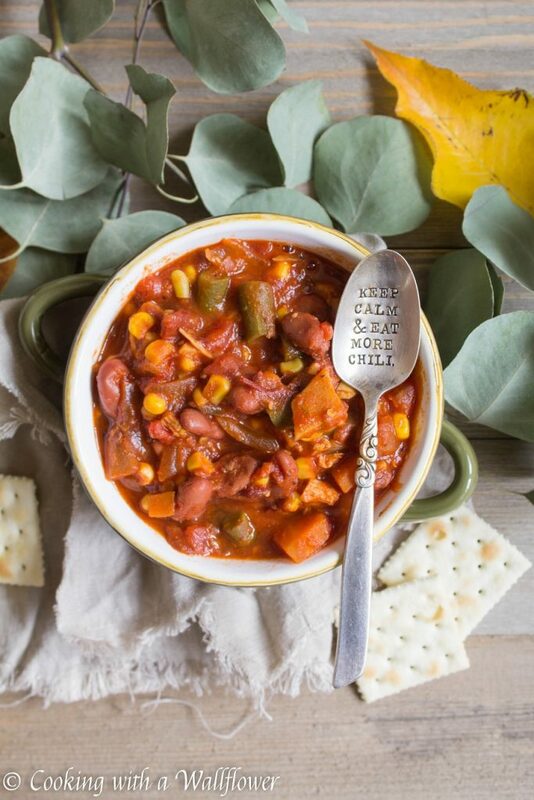 I love love love soups and chilis, too. And I’m a little envious of your spoon, lol!! 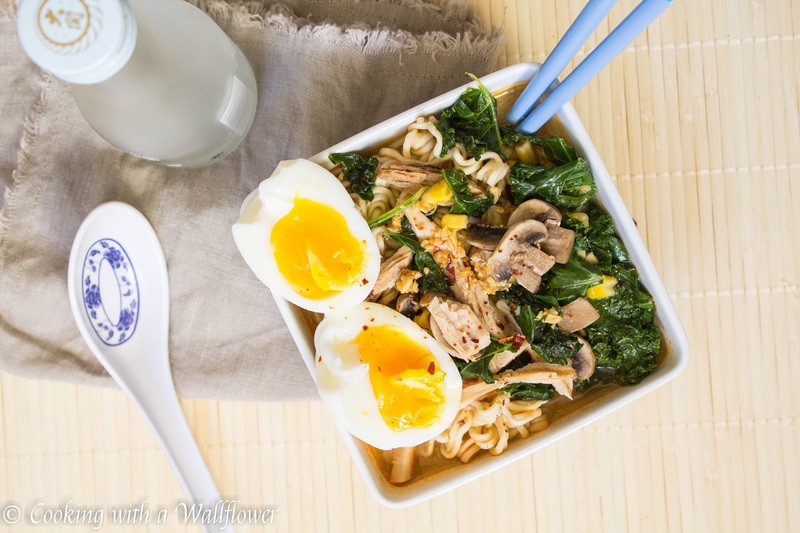 Great leftover idea and I wish I had a bowl right now. Thanks for sharing with us at Fiesta Friday! 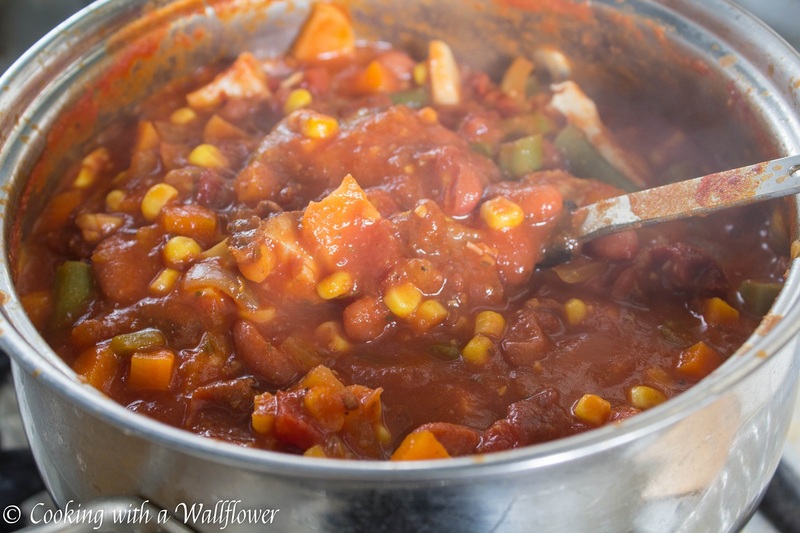 I have been on such a turkey chili kick the last couple of months. I cannot wait to try this recipe! it looks so hearty! Yum! Hope you’ll like it, Chenoa! We never have leftover turkey as everyone enjoys the sandwiches. Next year (or maybe before then I will use chicken) and try your chili. I have a couple of recipes but could always use another one. Thanks for partying at Fiesta Friday. Your food always looks so appetizing! Thanks! This sounds excellent! I like to make turkey sandwiches with an extra slice of gravy-soaked bread in the middle (a la Ross from Friends). I’ve never had that before. It sounds good though. I’m a fan of the left-over turkey sandwich on crusty bread with mayonnaise, a bit of salt and fresh ground pepper, enjoyed with a cool beer. 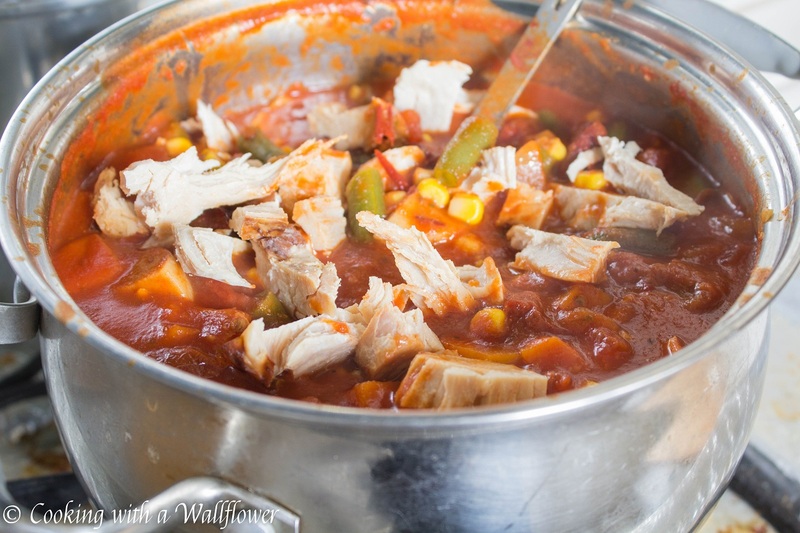 When I was growing up, Mom would make a soup with the turkey carcass and it was always hearty and homey and amazing. Sometimes she would make turkey pot pie, which defined comfort food for my young soul.